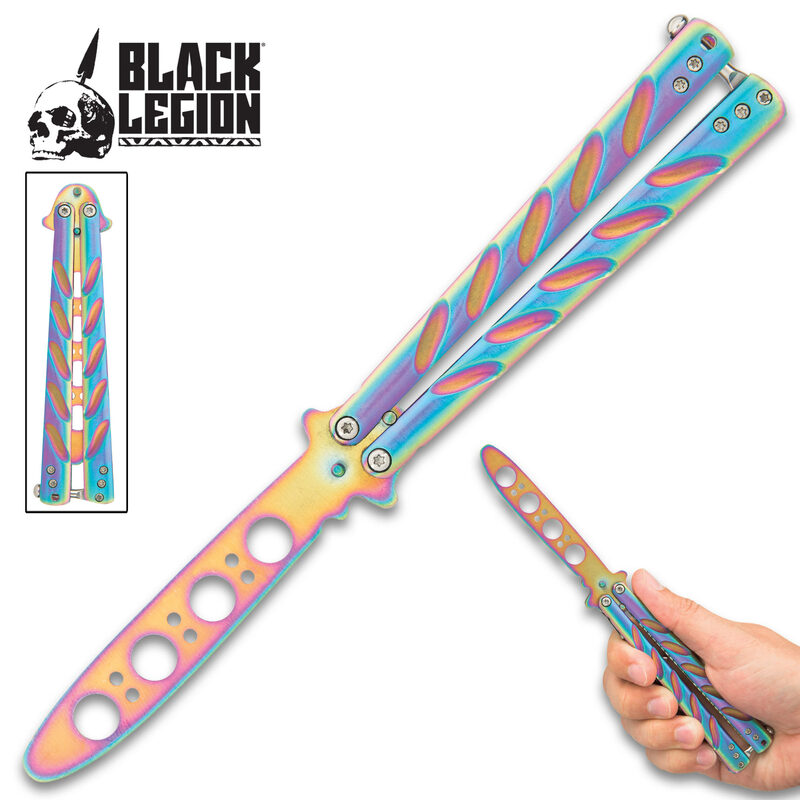 Black Legion Balisong Butterfly Trainer Rainbow | BUDK.com - Knives & Swords At The Lowest Prices! Master your butterfly knife skills with the Rainbow Black Legion Butterfly Trainer! This trainer looks and feels just like a real butterfly knife with an unsharpened, false edge blade. 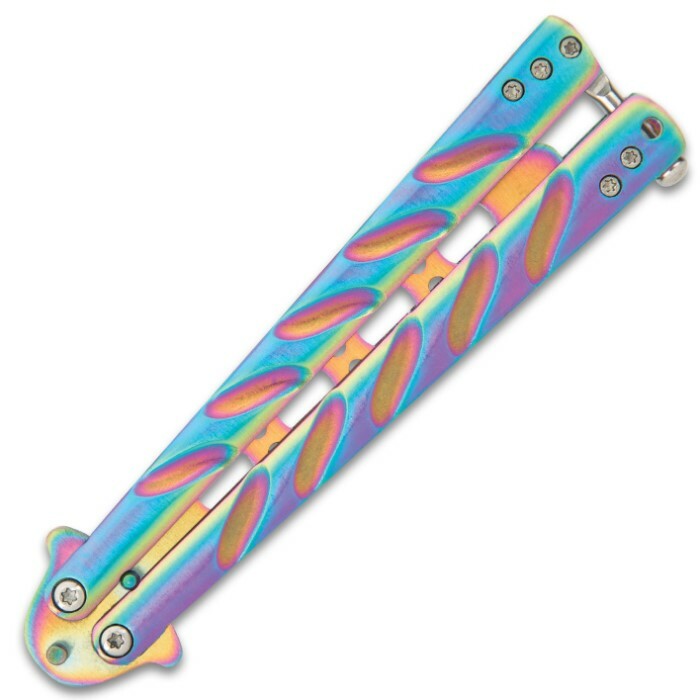 The entire trainer is constructed of stainless steel with a Rainbow Titanium finish. The handles are getting loose and one of the pegs fell out after a month, and i cant get the peg to fit back in, but no scuff marks and very pretty. Its ok for a while then just stars to fall apart. First off let me say if you want a trainer that won't fall apart on you leave this site. I bought this trainer flipper and ten minutes out of the box it broke. I then proceeded to fix it and an hour after use of the fixed version it fell apart again. Don't make the same mistake I did. And if you want a word of advice you get what you pay for and you'd be better off buying one that is at least 25 bucks. Price matters with quality trust me I have 10 flippers. I bought this trainer for my grandson, he loves to fidget. When he got it he did the smart thing and took out the screws and lock-tighted the screws, so it doesn't fall apart. Simple preventive measure that makes all the difference! Overall fun trainer to play with and practice with. After heavy use, did start to fall apart. Looks cool, and for the price isn't to bad. Also, when it first came it took awile for everything to losen up. I lost the little metal pin that goes in the blade, so now the handles don't stop the blade, minor problem with a trainer, but still ticked me off.